Work where you want with minimal compromise and maximum sanding freedom! 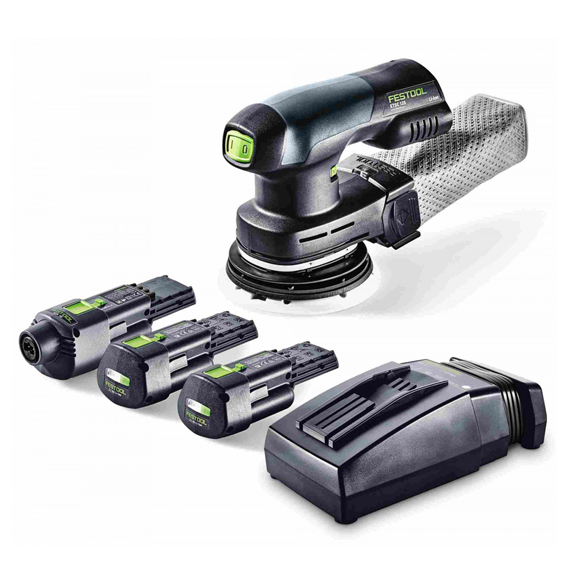 The Festool ETSC 125 LI 3.1Ah Cordless Eccentric Sander Set is a true hybrid sander that lets you effortlessly transition from corded to cordless operation. Balanced with a unique ergonomic battery for optimum performance and handling, the ETSC 125 provides the same functionality of its corded counterpart but with hybrid power options - use it cordless or corded. The 18-volt 3.1 Ah Ergo battery provides up to 30 minutes of runtime at full power for the brushless EC-TEC motor. Thanks to Plug-It mains adapters, they can be converted into mains-powered machines quickly and easily for continuous electrical operation. Set Includes: Cordless ETSC 125 LI 3.1Ah Eccentric Sander Set; StickFix Soft Sander Backing Pad (125mm); Long-Life Dust Bag; Edge Protector; two (2) BP 18 Li 3.1 ERGO Battery Packs; Rapid Charger TCL 6; and a ACA 18V ERGO Power Adapter and Plug-It Cord; all in a SYSTAINER SYS-Combi 2.